Firstly I apologise for the lack of posts this week, I have had a crazy busy week, but a very good one for that matter. 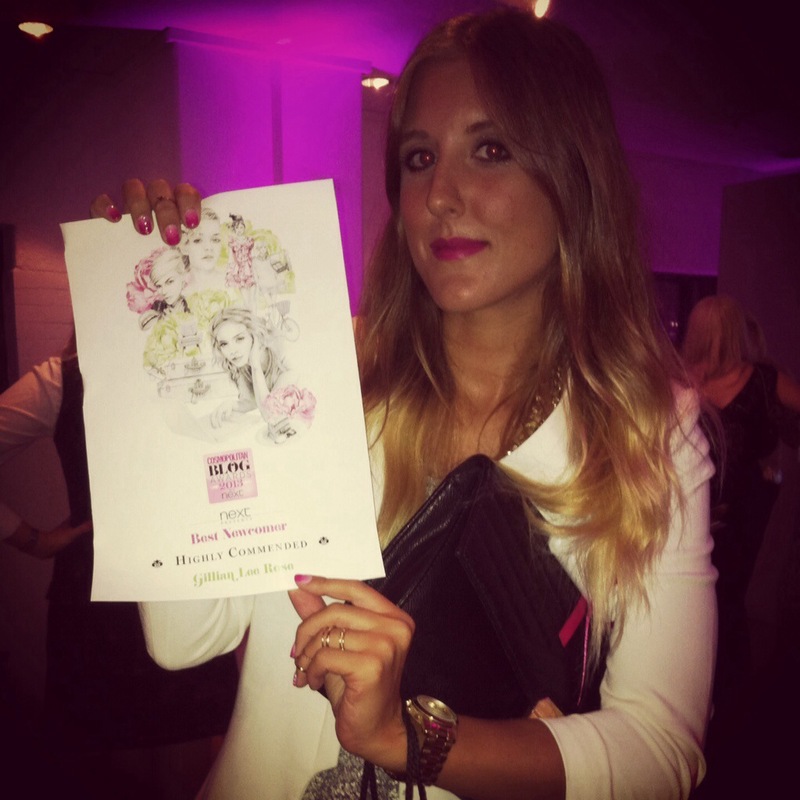 As you have probably seen via Cosmopolitan’s or my instagram or twitter (unless you’ve been living under a rock) on Wednesday 2nd October held at the landmark OXO tower on Southbank were the uber glamourous Cosmopolitan blog awards in association with Next. I will pre-warn you that this post is fairly long as there was so much amazing-ness to cover and it is extremely photo heavy….enjoy! 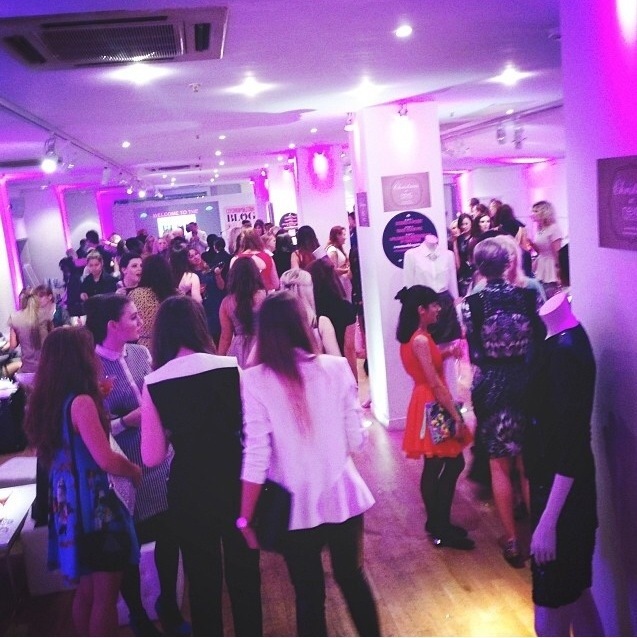 Way back in May the nominations started for the Cosmo blog awards and after a long wait we finally found out who the lucky shortlisted finalists were. To say I was shocked to make the final 10 in the Next newcomer award was a huge understatement. 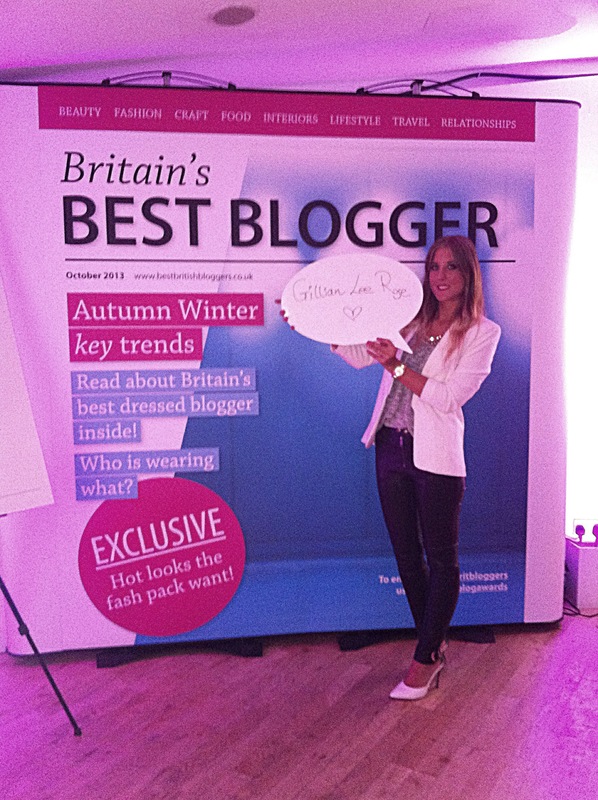 As I write this I have only been blogging for 10 months and having already been shortlisted for the Company blog awards for best personal style newcomer, I couldn’t believe that I had made the shortlist for the second time for another huge publication such as Cosmopolitan magazine. 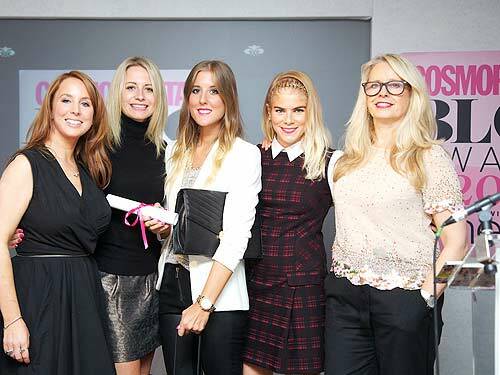 It is a huge honour to have my blog read by the likes of the judging panel at Cosmo and it’s amazing that bloggers are getting not only recognition but rewarded for all the effort and time it takes to do every blog post. 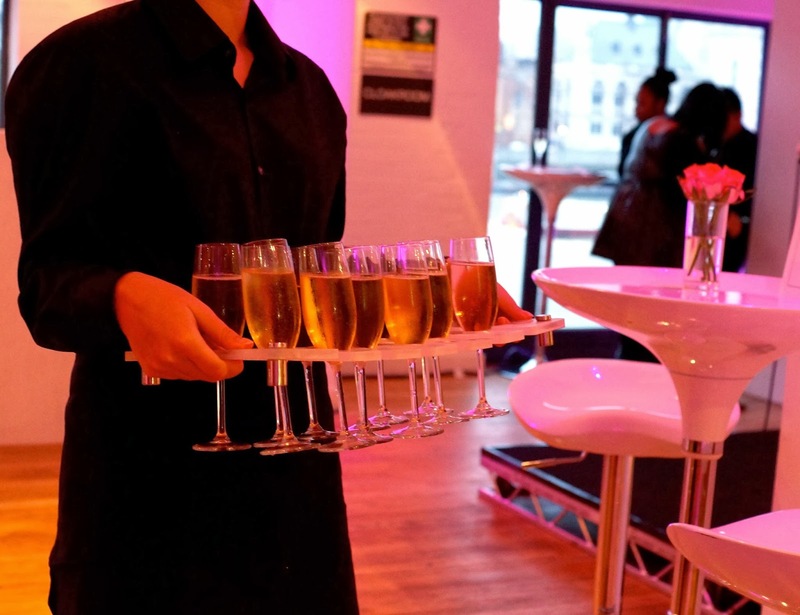 The event was held at the famous OXO tower on Southbank with the Thames as the backdrop of the party through the floor to ceiling windows. The whole room was white with an instant buzz as soon as you entered. There were the country’s best dressed fashion bloggers and beauty bloggers as well as all the shortlisted bloggers for the other categories such as travel, food and interior design. 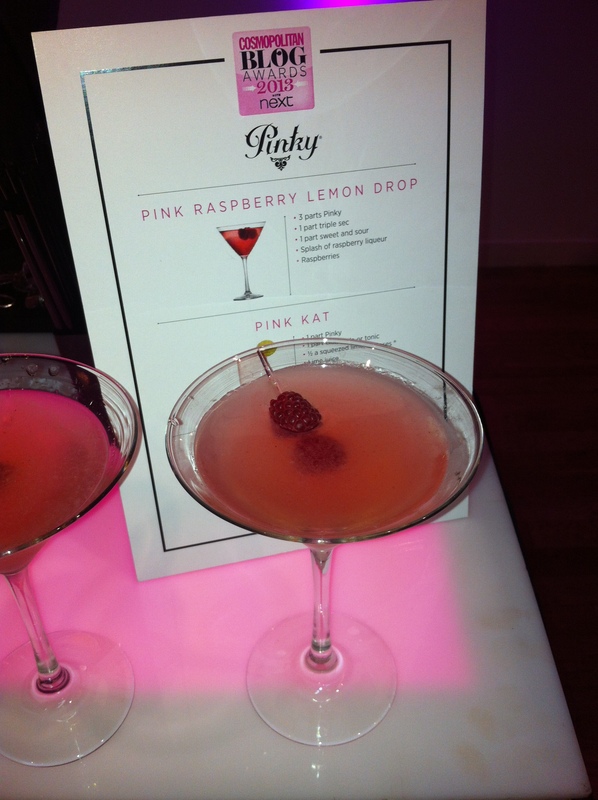 There was free flowing champagne and fabulous cocktails courtesy of Pinky Vodka, with 3 different ones to choose from we were spoilt for choice. Waiters and waitresses circled the room offering mini dishes including prawn cocktail, cheese souffle and a meat dish topped with yoghurt and carrots. 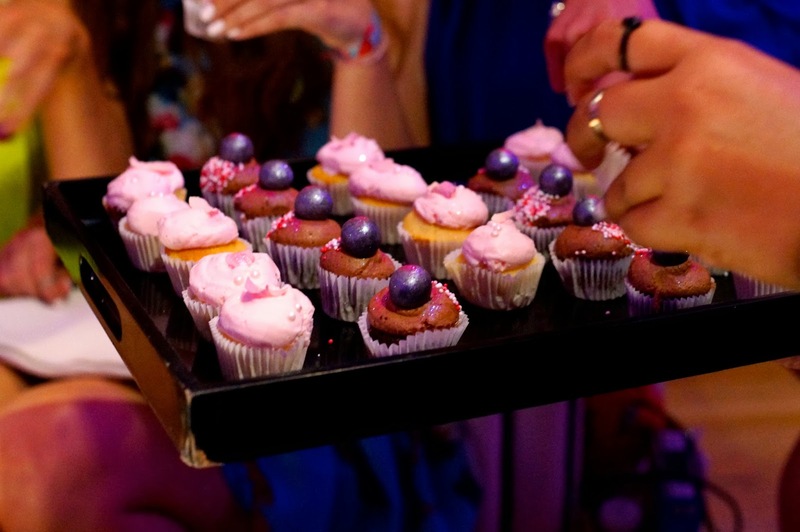 Afterwards we were treated to mini cupcakes from the lovely Two Little Cats Bakery. Mini cupcakes from the Two Little Cats Bakery, they were very yummy! The night was beyond my expectations and Cosmo went all out on every detail. Next were there to showcase their Christmas collection which was dotted around on mannequins styled in luxurious outfits giving us a taster of whats to come. Think velvets,rich deep shades of burgundy, gold jacquard prints and big statement gem necklaces. It’s definitely worth getting excited over. 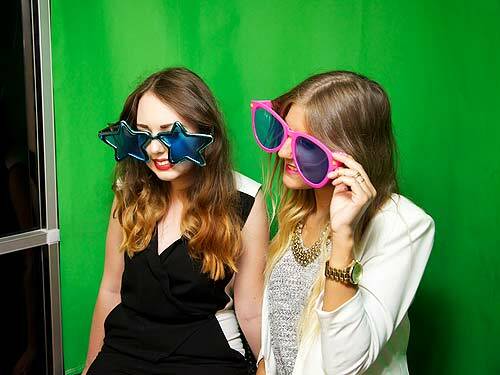 We all had a go in the photo booth complete with props thanks to the people at Photobooth Mania and the lovely people from Brit Bloggers were on hand to give us tips on working with brands. 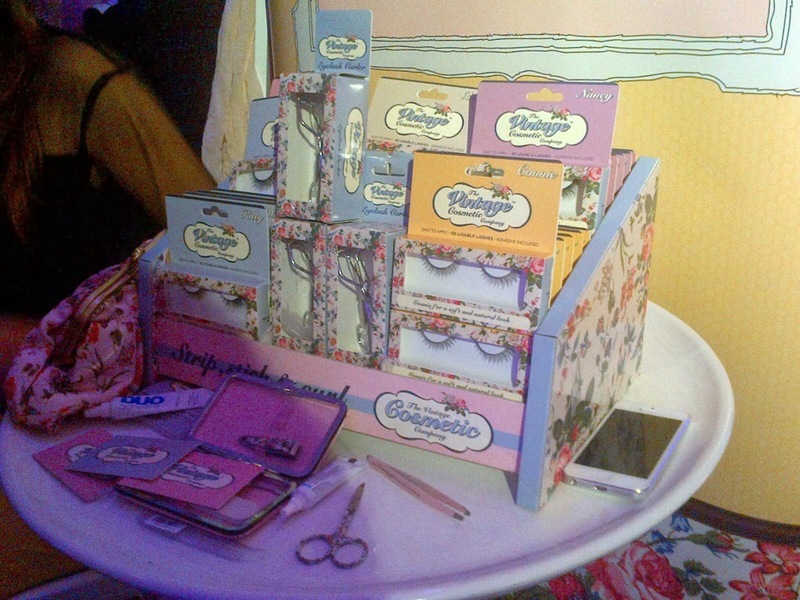 The vintage cosmetic company were applying complimentary false lashes and MW nails were dishing out free manicures to ensure we looked fashion fabulous all night long. As Louise Court the editor in chief and Pat McNulty the digital editor took to the stage we all gathered around excitedly for the news we’d all been waiting so long for. They read out each category and the winners went up to have a photograph of them receiving the award from the editors. Then came the category I was in, I waited patiently as the social media girls from Next went up to join on stage to present the award for best newcomer as Next were sponsoring that particular category. Then they read out that the highly commended award for best newcomer goes to Gillian Lee Rose!! I could hardly believe my ears as I made my way up to the stage. I was presented by the Next girls and we all smiled for some photos. I was on cloud nine as I made my way back down and got to texting my family to let them know my good news. Next up was the final award for the overall winner of the Next best newcomer and this award went to a wonderfully brave girl who has had her whole life turned upside down. 23 year old Laura from Laura Louise And Her Naughty Disease won the award for best newcomer for her blog about her battle against breast cancer. She has gone through hell and back and came out of it with a Cosmopolitan award to boot, and deservedly so. I couldn’t have been happier for her and I was over the moon that I came highly commended to someone as brilliant as her. You should check out her blog which she has kept surprisingly light hearted whilst telling you the all about her journey since diagnosis. I’m so glad she won and as she went to collect her award the happiness on her face was an image that made the whole room smile. Well done Laura!! The whole night was amazing and it was made even better by the lovely girls I met before and went to the awards with. 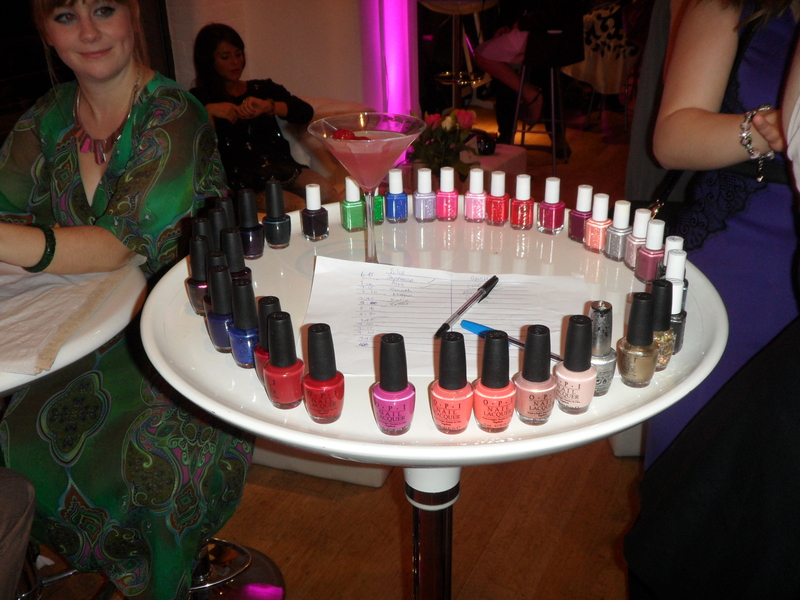 Ellie from Ellie’s Ramblings, Sophia from Sophia Meola, Jess from Copper Garden and Natasha from It’s Simply Beauty. My outfit was the biggest worry of the night. As I was flying back from Corfu for a few days for the awards I only had hand luggage. Let me tell you, this was not an easy task! Trying to get all my options into a holdall was like trying to get an elephant into a smart car. I had to cut my losses and pick my 1 outfit option and roll with it. 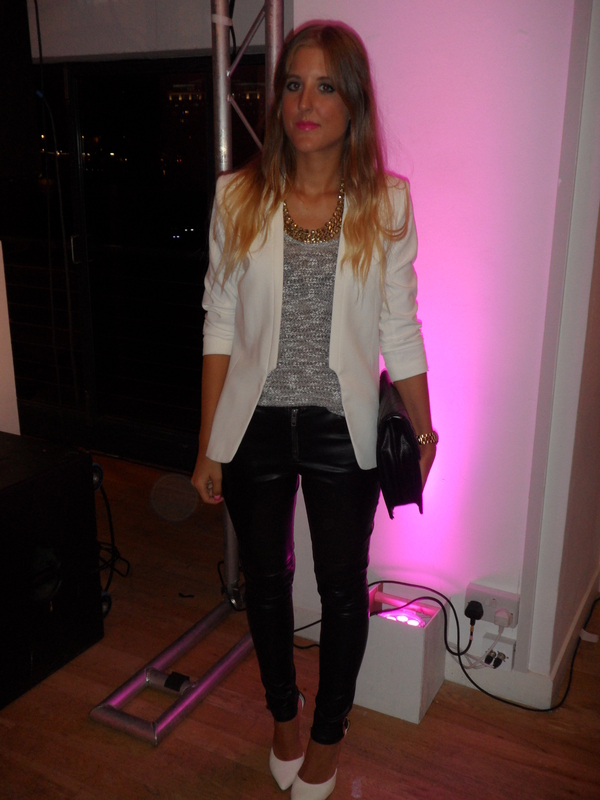 I decided on faux leather trousers as they really dress up an outfit and look chic with anything. I went for a charcoal grey marl vest top with an open extreme low back, the back never was on show as England is a lot colder than Corfu at this time of year but I just really liked the dark colour of it and it went perfectly with the rest of the outfit. I added a slightly off white blazer which gave the whole look a sophisticated twist. I got an amazing bargain on the shoes the day before the awards. I had a pair ready to wear but found these on a quick shopping trip for an amazing £14 but when I got to the till they had gone down to a ridiculous £8!! It is the best when that happens. I left the shop with a big grin on my face and an extra few pounds to buy a new Topshop lippy. Win win all round. I loved how these shoes looked with the outfit and kind of brought it all together as they were the perfcet shade for the blazer. I accessorised with a gold chunky necklace that sat high on the collar bone and my watch along with a couple of rings. I worried I was going to be seriously under dressed as the day before a lot of bloggers were revealing their outfit choices and the panic started to set in as it was mostly dresses and skirts. However, on the night I was so comfy and felt quote dressed up due to the texture and colours I was wearing. Monochrome is a great way to smarten an outfit up. I even made it onto the Cosmopolitan best dressed street style page of the night. You can check it out and some other amazing outfits from the night here. I dressed my nails for the occasion as a simple one colour mani just wouldn’t cut it. 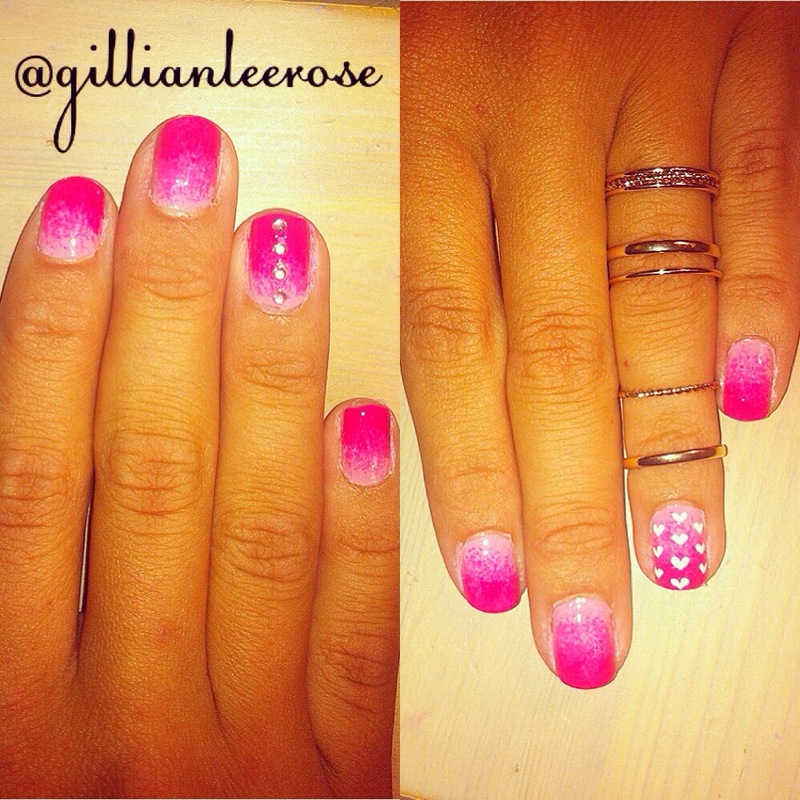 I went for a pink ombre background, I added little polka hearts to my left ring finger and a line of gems down the center of my right ring finger. I didn’t want to do something on every nail as I think it would have been too much and as my outfit was quite simple I felt this was perfect. I dressed my hands in a gorgeous stack ring and on one hand and a ‘G’ initial ring on the other with a midi heart ring on the same finger. I didn’t wear any bracelets as I had my watch on and the stack ring is quite detailed so I left it as just the rings to do the work as I like simple but effective accessories. I got home and immediately rummaged through the goody bags which were so heavy it was like doing weights all the way back to Waterloo. I also got an extra bag of Next goodies as I was one of the winners which was also packed with amazing pieces. I unfortunately didn’t get a picture of everything in the bags laid out as I had to fly straight back and didn’t have time to get one but I will tell you all the bits and pieces that were kindly given to us lucky bloggers. – Gizzi’s Skinny Weeks & Weekend Feasts cook book, Elemis peachy perfect face wash, Pinky Vodka, Two Little Cats Bakery biscuit, Little Miracle organic tea, USB microphone, Vita Liberata self tan & mitt, Method hand wash, Propercorn popcorn sweet & salty, Lindt chocolates,Pearl Drops whitening toothpaste, Peppersmith Mints, Next faux fur head scarf, Next chunky chain and leather necklace, Next tights, Next luxury candle (which smells AMAZING! 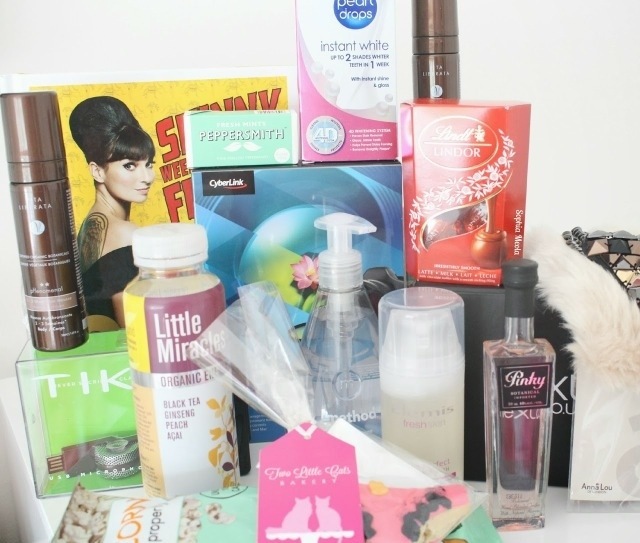 ), Photo Director editing software, Next faux fur belt, AnnaLou of London jewellery, mixed flavoured tea and a whole bunch more….We really were spoilt little bloggers! 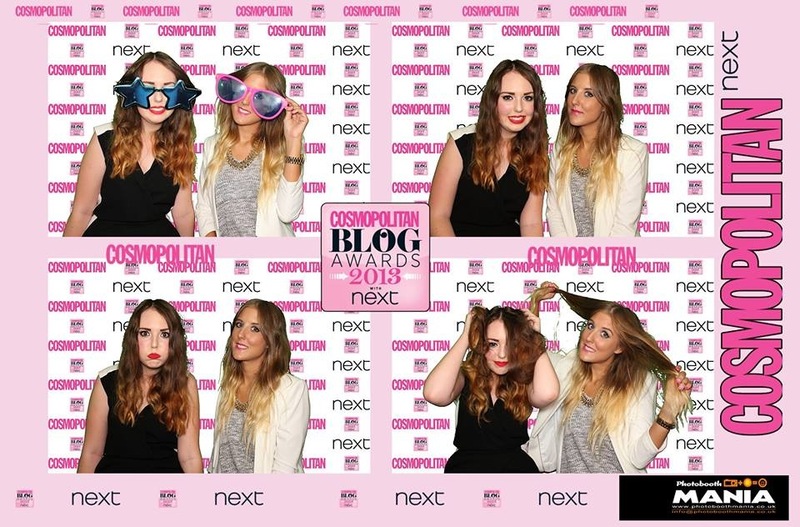 Thank you Cosmopolitan for giving bloggers the recognition they deserve for all the hard work that goes into every sinlge blog out there and also to Next who sponsored the event and gave us amazing Next treats. Also a big thank you to all the other companies offering their time and services to us on the night and all the staff who made the event run smoothly. Most of all though a big big THANK YOU to all of you who nominated me to enable my blog to be shortlisted in the first place and then to every single of one of you that voted for me to win, all your hard work paid off and it was one of the proudest moments so far and it’s all down to you for helping me out. Thank you!! 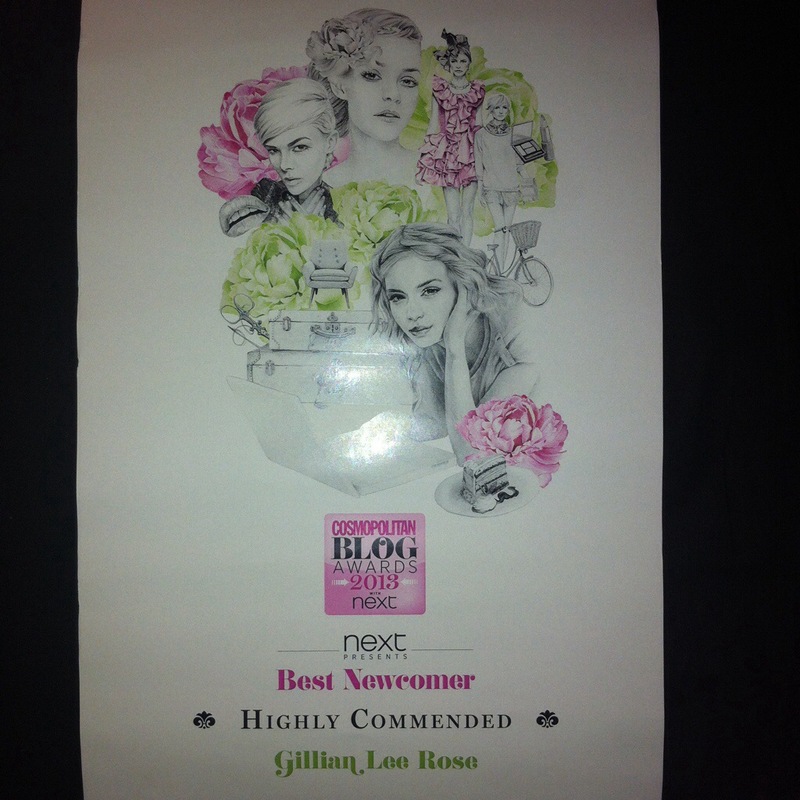 My certificate for my award, the gorgeous design was done especially for the Cosmo awards. Congrats darling…. Such a fab event and a great achievement! !